ADDRESS: 31/1 Tran Cao Van St., Hoi An Town, Quang Nam Pro, Vietnam. 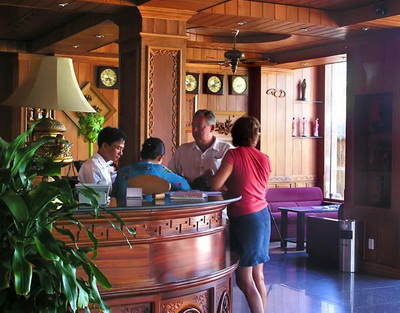 Phuoc An Hotel is located in the green and quiet area, just few steps to the downtown of Hoi An the UNESCO world hesitate site. The beautiful Cua Dai beach is a 5 km biking and Da Nang international is 35 km drive. 30 stylish rooms with full equipment, feature a window and balcony overlooking the garden, pool of alleyway Champa restaurant severs local special disks in the fresh air, Sky ban, swimming pool with Jacuzzi. ADSL internet connection, airport transfer, currency exchange, safety box , laundry service, motorbike rental.